I have been in the call center industry for almost 9 years and to be honest I still have a lot of slip ups pronouncing some English words. The Poem entitled “The Chaos” written by Gerard Nolst Trenité proves that English is a tough language because there are a lot of irregularities in spelling and pronunciation. 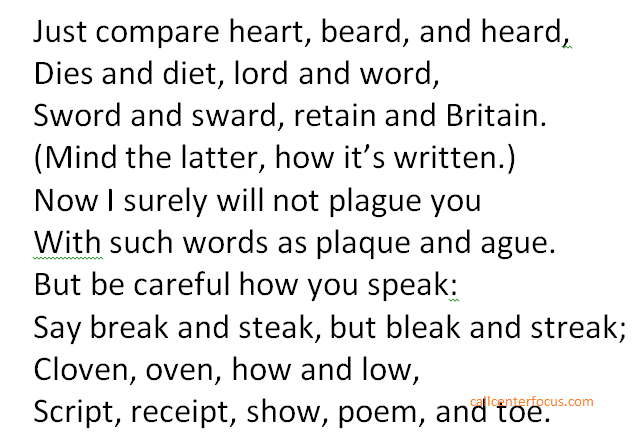 According to sources if you can pronounce the words correctly on this poem, you are speaking English better than 90% of the native English Speakers in the world. If you are ready, read the whole poem aloud with the correct pronunciation. Were you able to pronounce the words correctly? Do you think that some parts of the poem should be included in the test as part of pre-employment process in the BPO Industry? Share your thoughts in the comments section.